Creating a dump file isn't always as easy as right clicking in Task Manager and copying the file to your computer. Disclaimer - None of this article describes anything new or ground breaking, indeed Visual Studio 2010 has been out for quite some time. Developers don't usually spend their whole day debugging dumps until such time that there is a problem - thus this article serves as a quick refresher in times of need. 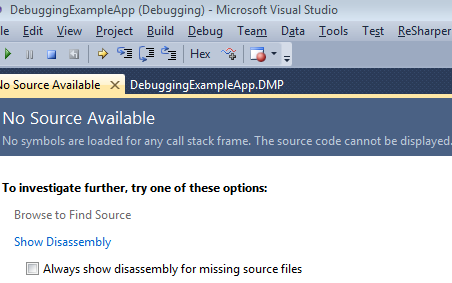 Visual Studio 2010 can open .Net4 process dump files to present you with a snapshot of the process in a familiar environment. Creating a dump file using Task Manager is easy (from Vista onwards) - simply right click the process and choose create dump. If you are running a 32bit OS and developing an app that targets x86 but deploying to a 64bit server then the yellow box is your scenario - you need to install Debugging Tools (x86) on the remote machine. UPDATE You can use the 32 bit version of Task Manager (located at C:\Windows\SysWOW64\taskmgr.exe) to create the dump file; this is much easier. If you still want to use Debugging Tools x86, view a previous version of this article which describes how to take the dump. I'll paste the text of the error message so as to assist someone searching for this error message. 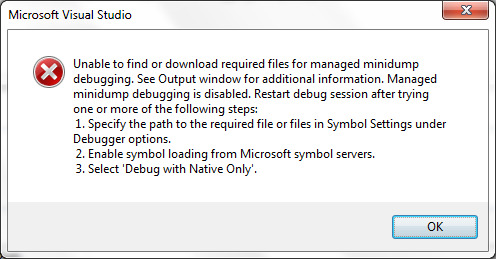 Managed Minidump Debugging: The debugger was unable to find or download version 4.00.30319.237 of 'mscordbi.dll'. Searching for this dll under C:\Windows\Microsoft.NET I find my version is indeed different, namely 4.00.30319.235. When you get this the first thing to check is the Modules Window (Ctrl-D,M) and examine the Symbol Load Information for the exe/dll in question. When you debug a dump file, the computer on which you debug must have access to the PDB symbol files and the binaries for the program. Visual Studio can cope with missing binaries for some modules, but it must have binaries for enough modules to generate valid call stacks. Otherwise, the "No matching binary found" message appears in the Modules window. 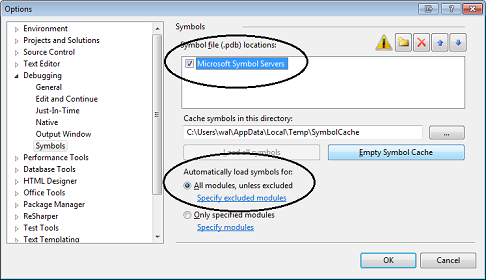 If for some reason VS isnt loading your modules from the dump folder then define a directory under Tools -> Options -> Debugging -> Symbols and put your pdbs/dlls in there. I have seen this occur but not in a consistent fashion. 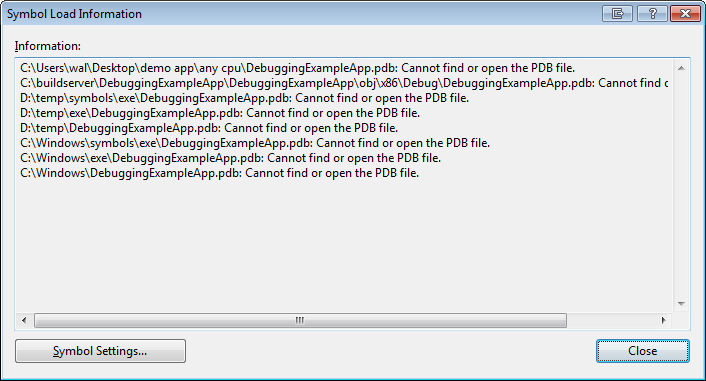 D:\temp\DebuggingExampleApp.pdb: PDB does not match image. At this stage you need to pray you do have the correct pdb somewhere. After you 'Debug With Mixed' the debugger should switch to Thread 1 and the relevant line in the source code automatically.